This entry was posted in 2012 and tagged 2012, fran, victoria. Bookmark the permalink. I’m a mix of both. I can write really well when I’m in a nice place like a coffeeshop…but ’cause I’m an ML, I usually get interrupted like every other sentence. It’s all good though. I love my wrimos and knowing that folks are hammering out a ton of words around me. It’s super inspiring and I can always make up my word count. ^_^ Fun comic! I love it! This happened to me, in a way. I went to the library to write, ran into a non-writer friend, and spent the whole day talking. Not sorry to see her, but I wrote exactly nothing all day. I had planned for yesterday to be a big writing day, too. Goal: 2.5k. Fail. It is good to meet people and talk. Just not during NaNo! Love Victoria’s expression in the last panel. O_O lol. Reblogged this on Antebellum Rose. I love this! So so so true! 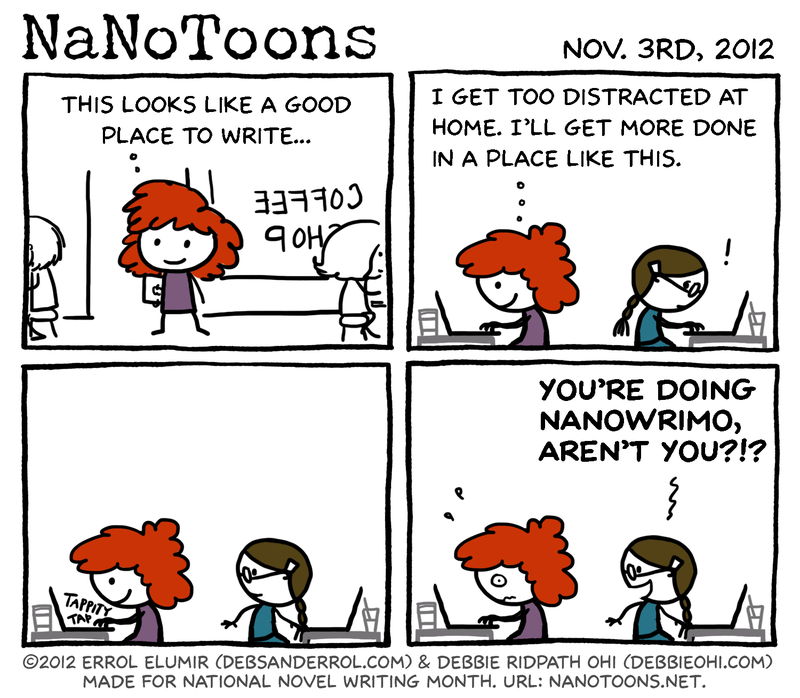 I’m writing a blog on NaNoWriMo, and was hoping I could use this image for the blog entry. I’d, of course, link back to your blog. Let me know! Yay!!!! Thank you so much!